Baby’s baptism is an important occasion. If such a milestone is coming up in your household, you might be thinking about a gift for your child’s Godparents. Something special. Something unique. Something to commemorate the event in a meaningful way. I’m not talking about coffee mugs or rocks glasses (not making this up…you can Google it!) for baby’s sponsors. These items exist, but at least for me, that’s not exactly what I’d have in mind. What if you could give baby’s Godmother and Godfather a fine quality, unique gift that’s been personalized especially for them? Something to honor the special relationship they will have with your child? Each of our personalized gifts for Godparents is custom-created – one at a time – using premium, museum-quality materials. 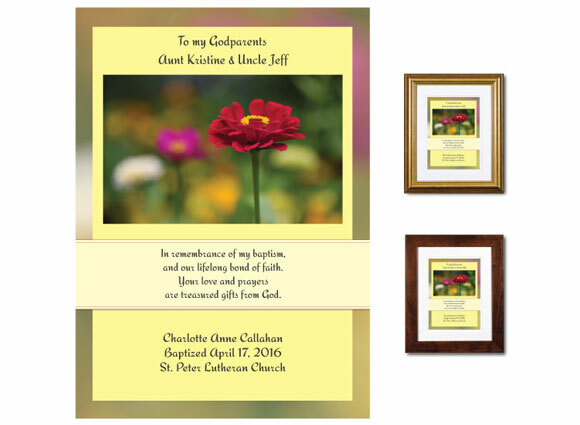 You won’t find these anywhere else; they’re exclusive to The Christian Gift. Give one on behalf of your child to mark this very special day and convey your thanks! It will be cherished. We also have a collection of Gifts for Godmother, and Gifts for Godfather.